The Comarca of Migjorn (southern county) is the southernmost part of the island of Majorca in the Balearic. The capital of the Migjorn county is Llucmajor. 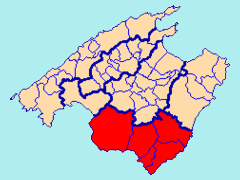 The county includes the following municipalities: Campos, Felanitx (Felanich) Llucmajor (Lluchmayor) Ses Salines (Las Salinas) and Santanyí (Santañy). Southern County (Comarca del Migjorn) is located in the southern part of the island of Majorca. To the west lies the county of Palma, in the north county Plain of Mallorca, and to the east is the Levant county. 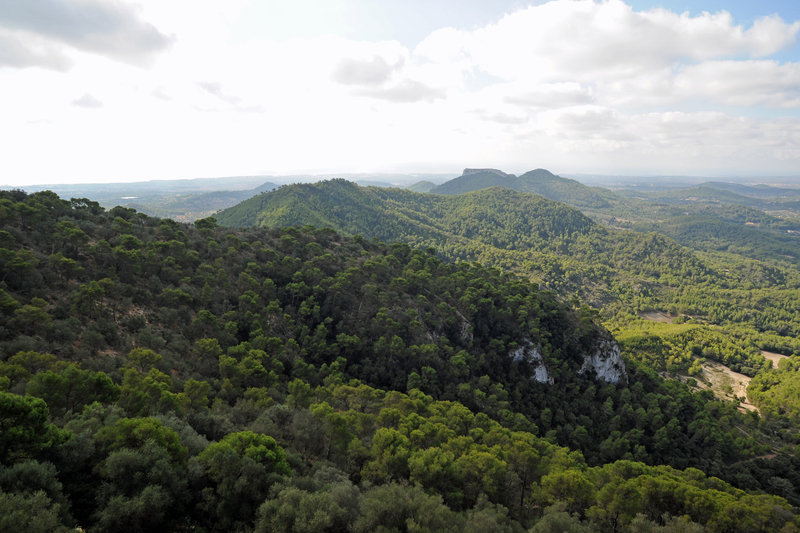 Migjorn is essentially the continuationto the south of the Plain of Mallorca (Pla de Mallorca) and the massif of Randa separates the two counties. It is a limestone plain, 500 m above sea level on average, the main peaks are the Hill of Sant Salvador (510 m), the Hill S’Envestida (421 m), the Hill of Santueri (390 m) and hill Fangar (319 m). The coast of Southern County extends from S’Arenal in the west to Porto Colom, to the east. The coast is a succession of sandy beaches and rocky headlands, with sometimes rather deep in Cala Pi (creeks Llucmajor). The cliffs can be tall as the Cap Blanc (85 m) in the municipality of Llucmajor. Some coastal areas are difficult to reach, especially the Cap de ses Salines, the southernmost tip of the island. 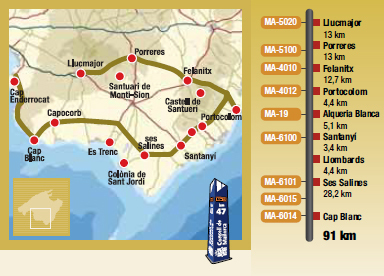 From the city center of Llucmajor (visit the monastery and the town hall) until Porreres (in Es Pla), crossing fields, a different landscape of scrubland characteristic of the coast of "Sa Marina". At Porreres, you can visit the historic center and the city museum and admire the stunning views of the sanctuary of Montision. In Felanitx, you can visit the neighborhood of the mill and the parish church, and the sanctuary of Sant Salvador and Castle of Santueri around. In Portocolom, a former fishing village, we discover an estuary with docks and vintage houses. Heading towards Santanyí it passes through the hamlets of S’Horta, Calonge and S’Alqueria Blanca. Make a stop in Cala d’Or, Porto Petro, the tiny Cala Mondragó protected by Natural Park of Mondragó, visit Cala Figuera, around a pretty steep cove and Cala Santanyi and, if time permits, "Es Pontas" . Continue towards Ses Salines and take the road to the cape and the lighthouse of Ses Salines to see the island of Cabrera. Visit the salt marshes of Colónia de Sant Jordi, the beach of Es Trenc, Campos and salt marshes Salobrar de Campos, and the Baths of Sant Joan de la Fontsanta, the only natural hot springs on the island. From Colónia de Sant Jordi, tours allow you to visit the island of Cabrera. Ses Covetes, Sa Ràpita and S’Estanyol are residential rather than coastal tourist areas. Visit the prehistoric village of Capocorb cliffs near "Sa Marina" of Llucmajor and farther, reaching the Cap Blanc and Cap Enderrocat with their towers.